Tony Stark the hero in the movie wore a special metallic suit to get inexhaustible power to fight villains, and although the exoskeleton is not a spectacular bright red like in the movie, the suit is definitely set to revolutionize human strength and capability. In appearance the Chinese exoskeleton looks more like an iron carcass with a bevy of sensors and electric wires. When worn, its sensors catch neuromuscular signals and respond with the right action. “Artificial intelligence will bring us into the second machine age, an age featuring exponential growth, and digitization and combined innovation,” said Tan Tieniu, deputy secretary-general of the Chinese Academy of Sciences during the Brain-Inspired Intelligence Forum in June, Xinhua reports. Mind controlled exoskeletons can be used in various fields. One such use can be in the military as the exoskeleton can be used to increase the fighting capacity of an individual soldier. Besides military the exoskeleton will come in handy during emergency situations such as firefighting and earthquake rescues. “For example, if a firefighter runs into a burning building with an exoskeleton, he or she can carry out two or more people who passed out due to the smoke, instead of carrying out one and heading into the danger again,” said Wang Yucheng, an assistant researcher at the Institute of Advanced Manufacturing Technology. 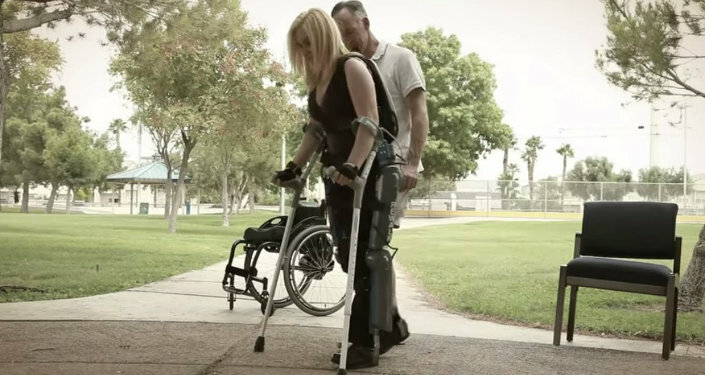 Even in medicine exoskeletons will be useful for the disabled to aid them in walking or moving. During the opening ceremony of the 2014 FIFA World Cup in Brazil, 29-year-old paraplegic Juliano Pinto kicked a soccer ball to start the games with the help of a mind-controlled exoskeleton. More recently, researchers from Brown University and the University of Pittsburgh Medical Center succeeded in enabling brain-controlled robotic prosthetic limbs on paralyzed patients in 2012. China is focusing on research in the brain and cognitive science filed making it the national long-term science and technology development plan through 2020. Experts have also disclosed earlier this year that the Chinese government would publish the country's brain project shortly. “Research into brain-inspired intelligence has been included in the development strategies of major developed countries. China should boost the development of AI to seize the commanding heights of the new round of technological revolution,” Tan said.